The issue of contemporary maritime deterrence in an era of competition and challenge to security was the focus of an international conference jointly hosted by the University's Dartmouth Centre for Sea Power and Strategy (DCSS) and NATO Maritime Command (MARCOM). 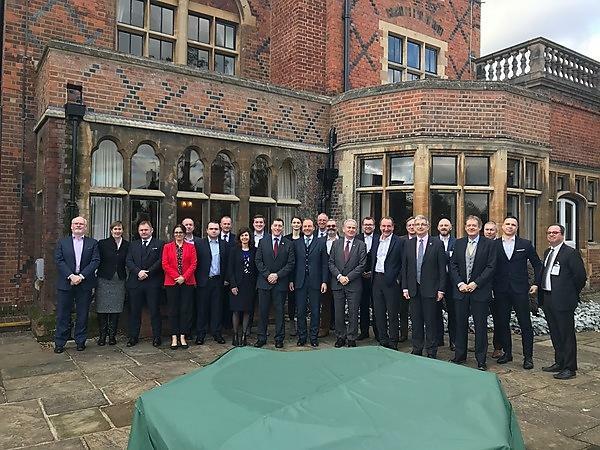 The second annual MARCOM-DCSS Sea Power Conference, held in Kingston-Upon-Thames, brought together academics, government officials, media practitioners and military leaders for wide-ranging discussions, held under Chatham House rules. Among the topics analysed were the actions that underpin a deterrent posture, the effective management of that posture, and the integration of strategic messaging. Lieutenant General Stuart Skeates CBE, the Deputy Commander of Allied Joint Force Command Brunssum, of the British Army, provided the keynote address, and among those who took part in the discussions were the Right Honourable Dr Julian Lewis MP, Chairman of the House of Commons Defence Select Committee; and Vice Admiral Clive Johnstone CB CBE, Commander Allied Maritime Command. MARCOM, as advocate for maritime NATO, works with Allied navies to enhance the Alliance's ability to coordinate internationally. These efforts provide deterrence both in the maritime sector and across the joint effort to support preservation of peace and stability in the region. The University was represented by Associate Professor in Strategic Studies & Director of DCSS, Dr Fotios Moustakis; and Mark Grove, Lecturer in Strategic Studies, at Britannia Royal Naval College, Dartmouth. The University's Deputy Vice-Chancellor (Research and Enterprise), Professor Jerry Roberts, provided a welcome speech. "The strategic partnership between the University and MARCOM aims to create significant insights regarding the Allied maritime dimension of deterrence: the actions that underpin a deterrent posture, the effective management of that posture and the integration of strategic messaging. It also seeks to consolidate the University and the DCSS as one of the key academic organisations at the forefront of matters relating to strategy and maritime security." The inaugural MARCOM-DCSS Sea Power Conference in 2018 explored the relevance of sea power to 21st century conditions and examined its application in the strategic seas on the NATO Alliance. "A key element of SP19 is that its outputs are intended to inform discussions in MARCOM’s classified Maritime Operations Centre Directors Conference and Maritime Operational Commanders Conference later in the year,"
"The conference has sought to infuse MARCOM’s policy and operational discussions with the insights gained from this collaboration. The event’s success will lead to further collaboration between MARCOM and other academic institutions which will be led by DCSS." The University of Plymouth's Dartmouth Centre for Seapower and Strategy (DCSS) was established to meet the clear and growing need to raise knowledge, awareness and understanding of strategic and defence issues as they relate to maritime affairs and the use of seapower in the 21st century. Delivered by expert practitioner trainers alongside staff from the University of Plymouth our Continuing Professional Development (CPD) courses are designed to improve your knowledge of current security challenges, and enhance your skills to meet the demands of today's competitive security industry market.